Your relationships with your cloud providers may not be among the most important relationships in your personal life—but they could be among the most important relationships for your business. If your business is helping customers get the most out of the cloud, lots of cloud providers — such as Amazon Web Services, Google, Microsoft, and Salesforce — compete for your business. But some are much better at it than others. And if partners could choose only one cloud provider to do business with, they have a clear favorite. At the sold-out WPC in Toronto last week, Microsoft released a study from the independent market research firm AMI-Partners. It surveyed 614 partners around the world, who not only sell Microsoft solutions, but the other provider offerings I just mentioned, as well. They also did in-depth interviews with a smaller group of senior execs at these partners, revealing what they think of their relationships with cloud providers. Microsoft gets the highest marks on partner satisfaction with profitability, 86 percent, compared to AWS (79 percent), Salesforce and Google (83 percent each). 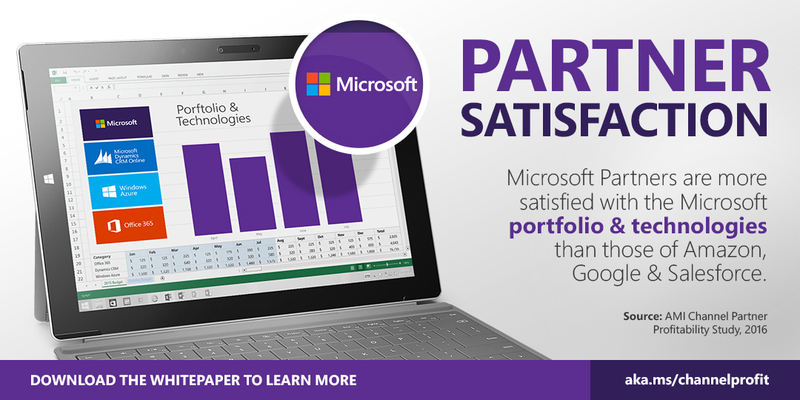 And Microsoft Gold Partners are even more satisfied, at 90 percent. The study found that partners’ margins are 19 percent higher with Microsoft. Average margins for Microsoft Gold Partners are 48 percent and 43 percent for all Microsoft Partners, compared to 29 percent for Salesforce, 33 percent for AWS, and 36 percent for Google. It’s all about the customer. Partners say that Microsoft enables a better customer experience (89 percent for Microsoft Gold Partners and 80 percent for all Microsoft Partners, compared to 74 percent for Google, 79 percent for AWS, and 81 percent for Salesforce), in part because of the level of support Microsoft provides. The best upsell and attach opportunities come from Microsoft. That’s why more partners are satisfied with the portfolio and technologies from Microsoft (88 percent of our Gold partners, 83 percent of all our Partners), compared to 70 percent satisfaction with Salesforce, 74 percent with Google, and 79 percent with AWS. Thanks to strong partner management, technical, and business support, 97 percent of Microsoft Gold Partners and 94 percent of all Microsoft partners are satisfied with their overall vendor relationship, compared with 87 percent with Google, 89 percent with AWS, and 93 percent with Salesforce. 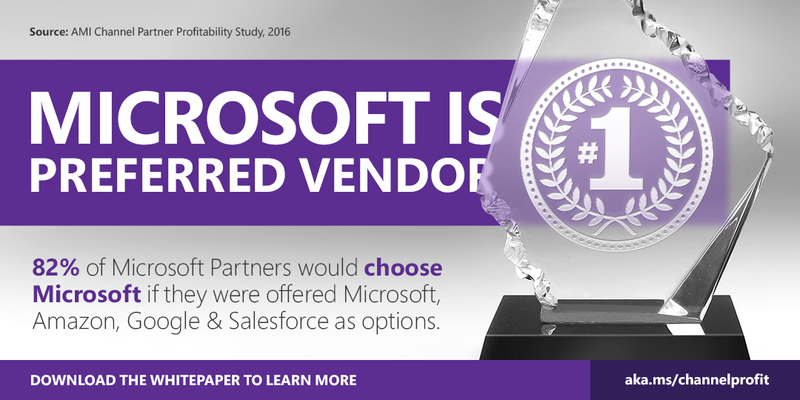 Given the survey results, you’d expect that if partners could choose only one cloud provider to do business with, they’d choose Microsoft. And they do. But look at the numbers: 82 percent would choose Microsoft, compared with 1 percent for Salesforce, 7 percent for AWS, and 10 percent for Google. If you’re selling cloud offerings to your customers and you’re not a Microsoft Partner, now’s the time to consider becoming one. And if you’re not yet a Microsoft Gold Partner, consider becoming one to receive even more great benefits. 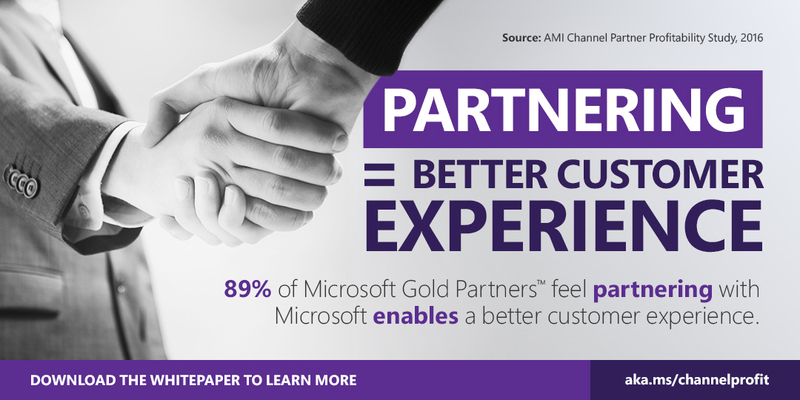 For more on the AMI Partners Channel Partner Profitability Study, visit http://aka.ms/channelprofit. To see more information on how Microsoft is ready to help partners who currently sell competitive services, check out the Microsoft Advantage. Are you experiencing momentum with Microsoft cloud services over your business with other cloud providers? Share your stories and best practices with me at jmccrum@microsoft.com. Have additional feedback or comments? Let us know on our Facebook page!